I was inspired by Carrie’s advice as I began the design of my mudroom. 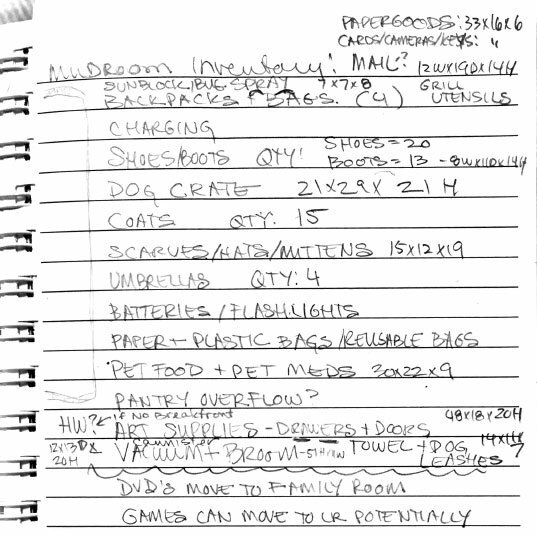 I started by inventorying all the items I would want to keep in the space. I do this with kitchen design projects for my clients as well. The inventory consists not only of the items that need to be stored, but the approximate size of the item. For example, I knew that I had lots of boots. C’mon, what designer doesn’t? I determined the quantity and also the height of my tallest pair. It turns out, even the tallest boots fit comfortably underneath a standard height bench. Lo and behold, an obvious boot storage zone presented itself. I chose to continue the brick flooring material underneath the boot area, so that if I bring in wet shoes, they will not dirty up a cabinet interior. And the bench is the perfect spot to sit and put on those very boots. Flanking this bench and cubby unit is a pair of coat closets. The left closet contains a rod for jackets straight across, with a couple of shelves for shoes. 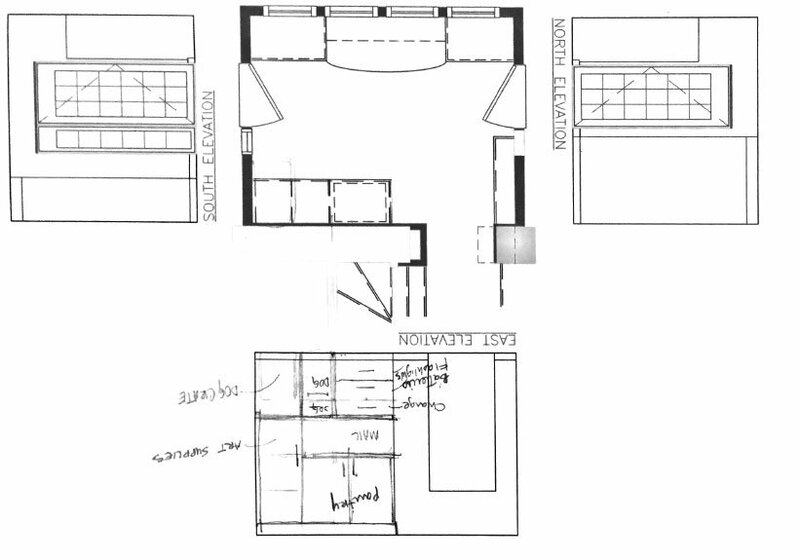 The right one is split in half, so that it is part coat closet, and also part broom/vacuum closet. This closet also stores our paper towels and napkins. Opposite the coat closet and cubby wall, I designed a mail and pet center. The wood countertop is the place where we sort our mail. 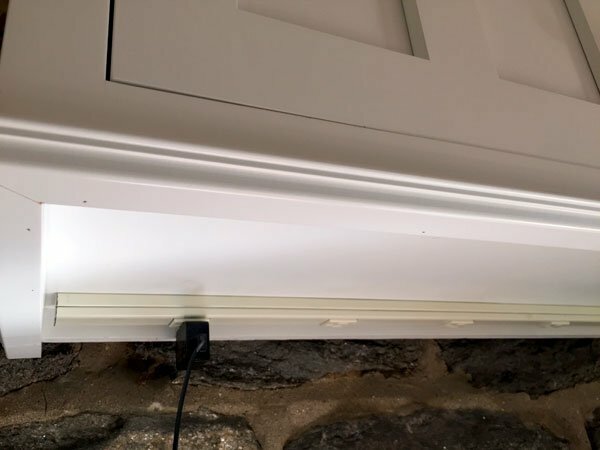 Under cabinet outlets allow us to also use this surface as a charging station. 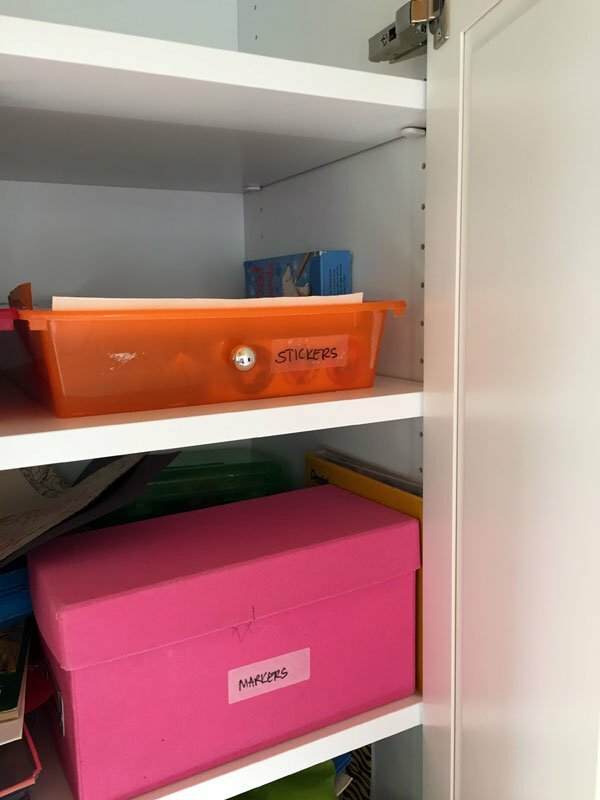 The door on the right houses art supplies, like markers, crayons, paper, and stickers, with the most frequently used items on the lowest shelves so my kids can reach them easily. Below the counter, on the right side, I designed a pet zone. 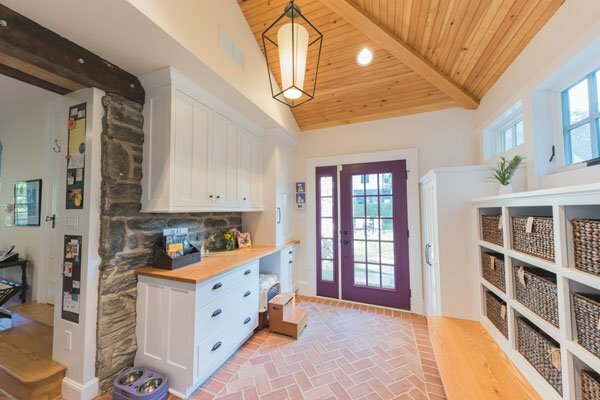 There is an alcove to store the dog crate. 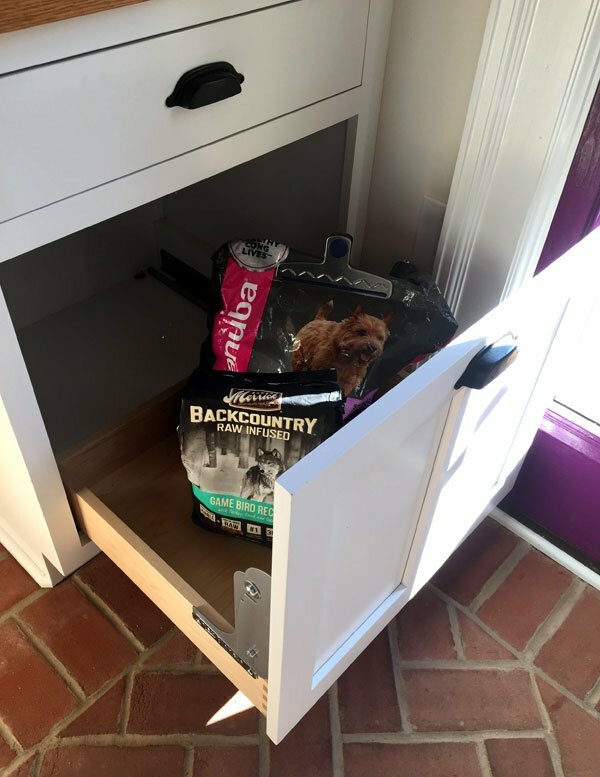 Immediately next to it is a pull out drawer where we keep dog food. Having a heavy bag of food down low is better for my back, and with the pull out mechanism, there is no chance that a greedy lowdown dog will break in there, even though the food itself is low down. 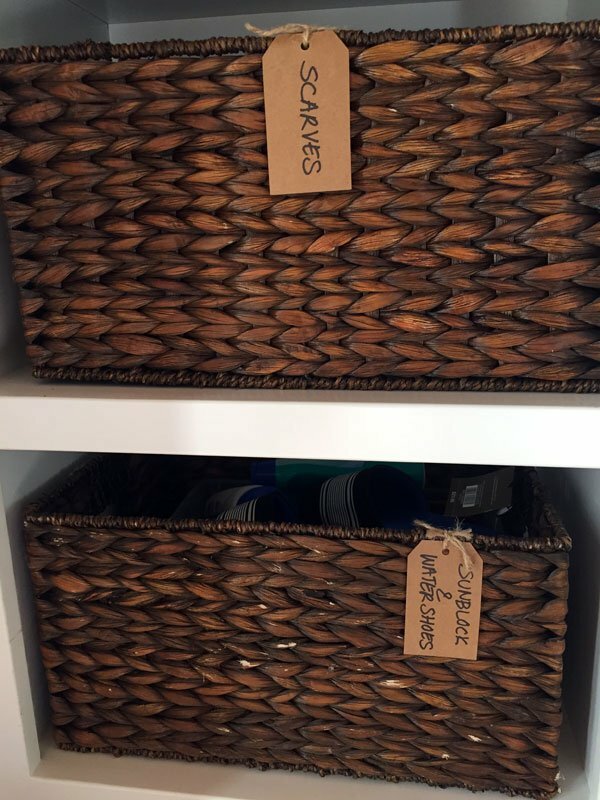 The left side of the lower storage unit contains drawers, and each has a dedicated purpose. Top drawer: laptop, chargers, scissors, envelopes, pens. 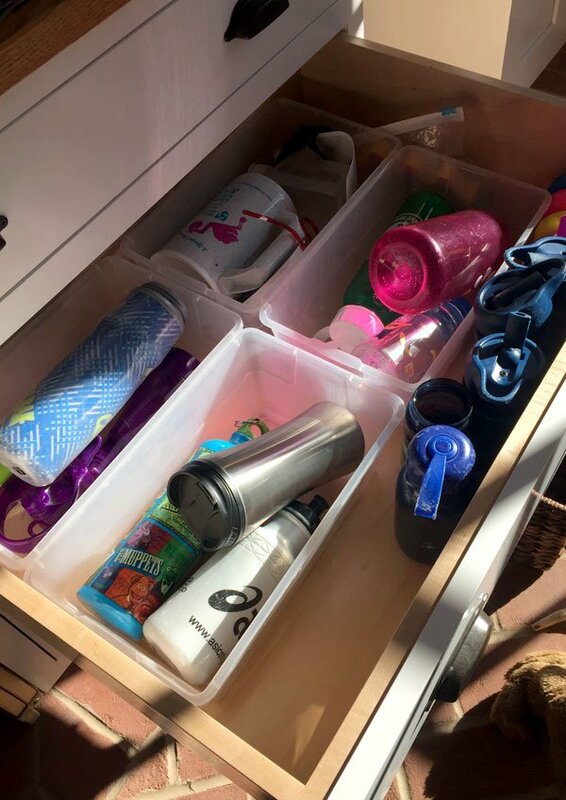 Middle drawer: water bottles. Having this item at a height that my kids can reach is desirable so they can fill their own water bottles before soccer or camp. Even though, truthfully, I do it for them most of the time. And the lowest drawer is for paper and plastic bags. Upper cabinets provide some space for pantry overflow from the adjacent kitchen. In addition to the closets and the mail and pet center, I also designed cubbies, one for each of my two kids. Each boy has four slots for shoes, and hooks for backpacks, jackets, and hats. One of my kids wears an orange fedora everywhere, so that was particularly critical. Now, my kids have no excuse to leave their stuff lying around and then claim they can’t find it the next morning. They know exactly where shoes and bags go at the end of the school day, and exactly where to find it again on their way out the door. Now they can “go happily on their way without skipping a beat,” as my friend Carrie likes to say! 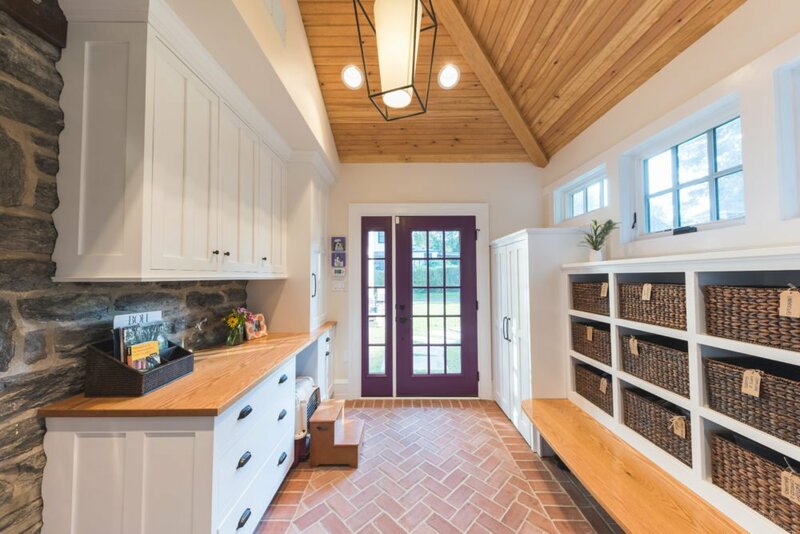 I simply love your mud room! It looks really interesting and very, very useful and organized. Thanks for sharing! It’s amazing. Thanks for sharing this amazing post.